Dermatopathology in the Desert: Practical Dermatopathology recalls Dr. Bernard Ackerman’s historical sessions in Palm Springs, annual events that attracted dermatopathologists and dermatologists to his charismatic personality and profound knowledge. Under the direction of Dr. Steven Billings of the Cleveland Clinic, a vibrant, modern, pragmatic, interactive version has been reimagined with five additional stars in the panoply of cutaneous pathology. The United States and Canadian Academy of Pathology designates this enduring material for a maximum of 16.5 AMA PRA Category 1 CreditsTM. Physicians should claim only the credit commensurate with the extent of their participation in the activity. The USCAP is approved by the American Board of Pathology (ABP) to offer Self-Assessment credits (SAMs) for the purpose of meeting the ABP requirements for Continuous Certification (CC). Registrants must take and pass the post-test in order to claim SAMs credit. Physicians can earn a maximum of 16.5 SAM credit hours. 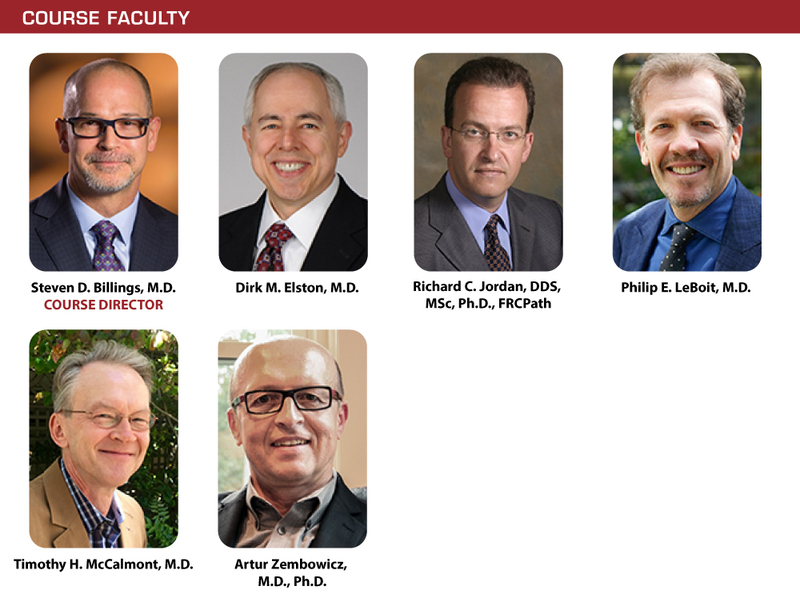 The following faculty reported no relevant financial relationships:  Steven D. Billings, M.D., Dirk M. Elston, M.D., Richard C. Jordan, DDS, MSc, Ph.D., FRCPath, Philip E. LeBoit, M.D., Timothy H. McCalmont, M.D., Artur Zembowicz, M.D., Ph.D.
Buy the entire Dermatopathology in the Desert Course and get a great discount!